Ruthiebear (Titusville, NJ, United States) on 7 June 2017 in Landscape & Rural. Nice red brown colours selected in the buildings. Bonjour douce Ruth, superbe, quelle belle ferme! Bise, bon mercredi dans la joie! Beautiful processing of this great old barn. Superb processing. Wonderful capture of a lovely barn. A fine picture of the barn. I frequently find myself farther from a barn than I would prefer. Circumstances simply won't permit anything else. A fantastic edition. I like this little red house in the middle of the landscape. HUGS! Fine processing of this nice barn. 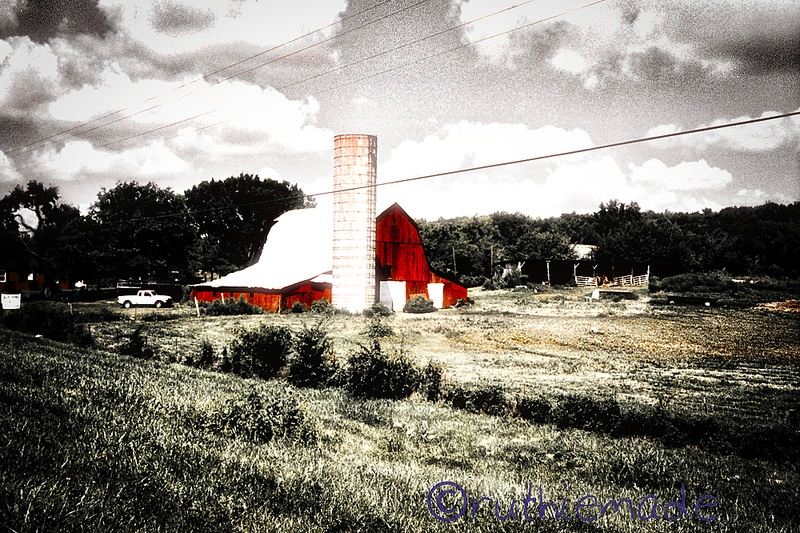 Excellent selective coloring that makes this barn really "pop" in the landscape!! Quel rendu et ferme quel rogue qui ressort et le silo sueprbe. Just love how you do this. Well done. I like the treatment. That is a beautiful barn. That is a great barn.